Below is an article I published in Distinctly Montana Magazine last December. Every day I become aware of at least one more study on the negative effects of climate change. It can be overwhelming. The more I learn about climate change, the more I want to ignore it and, instead, wrap myself in the snowy cocoon of Yellowstone and allow all the depressing news fly past me on my way down my favorite ski trail. But I have to ask myself, “Will I even be able to ski this trail someday?” This article describes the emerging field of ice patch archaeology – a nascent area of science that has become more urgent during the last few decades, and one that may one day be obsolete. The beveled end of a 4,000 year foreshaft with ownership markings. Photo provided by C. Lee. Rarely are organic artifacts like the foreshaft preserved long enough for archaeologists to find them, but the frozen environment of ice patches has held them in a state of suspended animation for hundreds or even thousands of years — that is until, the ice began to melt. As the climate warms, once perennial patches of snow and ice in Montana’s alpine country are melting faster than ever before, yielding artifacts made of wood, leather, and plant fibers that have lain frozen beneath the surface for thousands of years. The melting ice patches and the artifacts they are revealing have given rise to the emerging field of ice patch archaeology. Like glaciers, ice patches are areas of perennially frozen ice and snow. But because ice patches are small, they don’t move under their own weight as glaciers do. Instead, ice patches accumulate layers of snow and ice over centuries or longer which makes the ice at their cores as old as the ice patch itself. The older and more stable ice contained within ice patches preserves artifacts from long ago that would otherwise be crushed under the shifting weight of glaciers. Artifacts are often found along the edge of the ice. Photo provided by C. Lee. But how did the foreshaft that Lee recovered come to be buried in ice in the first place? Lee says that ice patches were attractive to Native Americans in part because the ice patches attracted the animals they hunted. Bison, bighorn sheep, elk, and deer may have used ice patches as sources of water, to cool off, or even to escape biting insects as lower elevation areas became warmer and drier throughout the summer. Although many of the artifacts recovered from Montana’s ice patches have to do with hunting, people also used alpine areas for travel, to escape the summer heat, or for gathering plants, says Lee. In one ice patch, Lee recovered a piece of plaited leather more than 1500-years-old. The leather was partially covered with the bark of a chokecherry tree, which was used for ornamentation by Native Americans. Some of the artifacts recovered from ice patches are much younger. At one site north of Yellowstone, Lee recovered part of a wooden shaft about four inches long. This weapon fragment was left behind just before Lewis and Clark embarked on their quest to find a waterway to the Pacific Ocean — a journey during which they write of their many encounters with Native Americans. Lee’s findings are something of a miracle requiring as much luck as it does hard work. It is part of a story whose first chapter begins with a long ago hunter or traveler who perhaps loses an arrow while hunting a bighorn sheep standing on an ice patch. Thousands of years later, Lee visits the ice patch at just the right time of year, when the snow conditions expose the artifact, but not so much that it is left unprotected. If the ice patch melts too fast or before an archaeologist can survey it, the arrow will decompose and be lost forever. “We don’t really understand how long it takes for these artifacts to decompose once they melt out from the ice, ” says Lee, “but it is only a matter of years and the longer these artifacts lay exposed to the sun and wind, the less we can learn from them.” Because of warming temperatures, a great many artifacts may have already been lost. Wooden artifacts collected from ice patches. Photo provided by C. Lee. Perhaps nowhere is climate change more evident than in Glacier National Park. In 1910, there were as many as 150 glaciers and today there are only 26. Dr. Robert Kelly, a professor of archaeology at the University of Wyoming, and Lee recently finished a three-year project surveying 46 of Glacier’s ice patches. We may not think of Glacier’s rugged mountains as inhabitable, but humans have had a deep connection with high elevation areas in Glacier for thousands of years. Glacier’s mountains are important vision questing sites and home to powerful Blackfeet spirits like Wind Maker, Cold Maker, Thunder, and Snow Shrinker (Chinook winds). Chief Mountain holds particular significance to Native Americans whose ancestral lands included the Park. The study was a unique collaboration between university researchers, Glacier National Park, the Blackfeet Nation and the Confederated Salish and Kootenai tribes. Tribal members helped survey ice patches and provided important information on place names, oral histories, trail routes, and traditional use of sub-alpine and alpine areas in the park. Although no human-made artifacts have been found in Glacier so far, the remnants of trees in some ice patches that are above modern timberline point to a climate that was once warmer than it is today. “During warmer periods of prehistory, some Native American groups may have increased their activities in the mountains, escaping the hot, arid conditions on the plains,” says Rachel Reckin, a University of Cambridge Gates scholar researching how humans adapted to living in the mountains of the Greater Yellowstone Ecosystem. Iceberg Lake in Glacier National Park. Although the climate has shifted in the past, the pace and magnitude of climate change today is unmatched in time which means organic artifacts are melting out of ice patches all over the world. Archaeologists have recovered leather pouches and shoes, a wooden knife handle, baskets, and darts in Switzerland, Norway, Sweden, Canada, and Alaska. In the Northwest Territories, a piece of sinew had archaeologists perplexed until a member of the Shu´htagot’ine Tribe recognized it as part of a ground squirrel snare. And of course you might remember Ötzi — the 1991 discovery of a more than 5,000 year old man preserved in the Italian Alps. Ötzi was probably a shepherd who appeared to be on the run when he was murdered, and then buried by snow and ice only to be found by a pair of hikers millennia later. Ötzi was so well preserved that researchers were able to determine his last meal — bits of red deer meat and a handful of cereal grains. Aerial view of ice patches. Photo provided by C. Lee. Just read this, Lisa, and find it fascinating and frightening. “Frightening” may not be quite the word, but the article points out yet another drastic change and loss brought about my climate change, one that hadn’t even crossed my mind before reading this. And I’m sure many people would say, “So, what?” and that is even scarier. Thank you for sharing this. 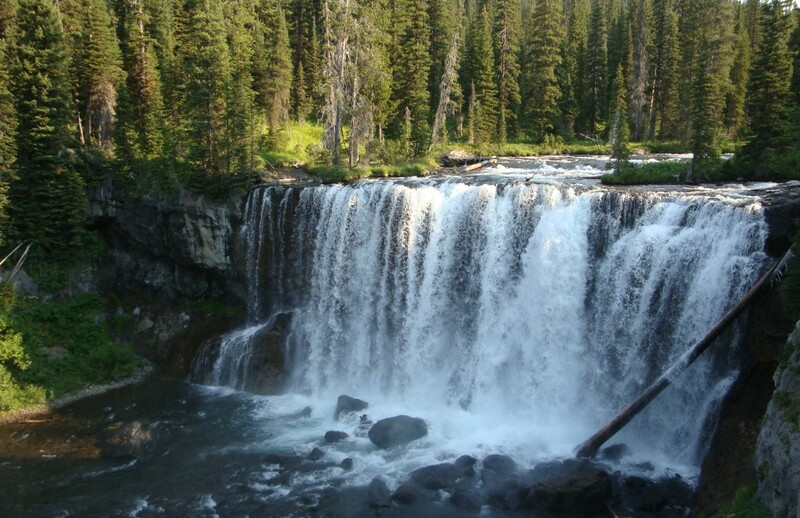 The last 11 years of my 30-year career with the NPS was in Yellowstone at Canyon (ca. 7900′), but I fell in love with the Rockies in 1966 as a junior in high school when my folks, my best friend and I travelled west from WI and spent 5 days in Glacier. We stayed with friends from our hometown, because the dad worked on the maintenance crew at St. Mary’s. We went on a number of hikes and interpretive programs because my high school biology teacher, Charlie Scribner, was a “forever” seasonal naturalist on the east side. Our last full day there and the culmination of our time with Charlie was to tag along on his hike to Grinnell Glacier. It was amazing! Now, as I see pictures of that glacier, I only recognize it because of the “Salamander’s” nose and the mountains behind. This is important work with such an immediacy, I can’t imagine. Thanks, again.